As interest in gaming PCs continues to grow, hardware companies that used to focus on specific niches have been expanding to include more varied lineups in a bid to get more business from DIYers seeking a cohesive look inside their rigs. In 2017, Corsair dipped its toes into full PCs, and EVGA rolled out closed-loop coolers. 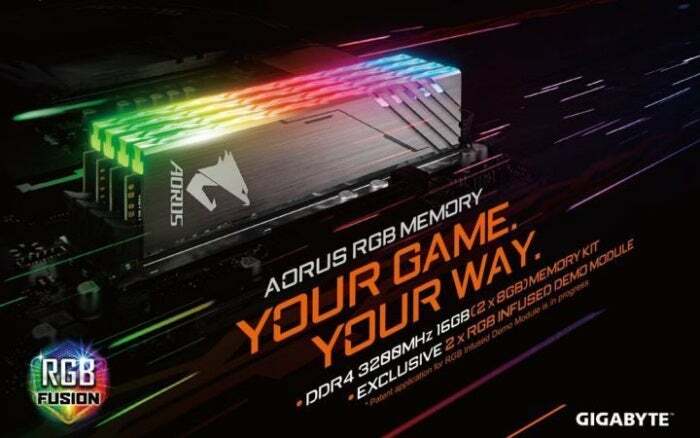 Now, Gigabyte’s making its debut in the memory market with the simply named Aorus RGB Memory. The dual-channel 16GB kit of DDR4-3200 memory has CAS timings of 16-18-18-38, Tom’s Hardware reports—but it actually ships with four sticks instead of the two you’d expect. Gigabyte’s tossing in a pair of “RGB-Infused Demo Modules” that are functionally useless, with no memory chips inside, but help extend the customizable RGB LED goodness to all four RAM slots so that you aren’t left with gaps in your illumination. The modules feature aluminum heatsinks emblazoned with the logo of Gigabyte’s high-end Aorus gaming brand and a strip of RGB LEDs. Of course, you control the LEDs using Gigabyte’s RGB Fusion software, which has been updated with five new lighting modes for the memory kit. It’s unclear whether the RAM plays nice with the RGB software included in rival motherboards, but we’re scheduled to visit Gigabyte at Computex later this week, so we’ll try to confirm compatibility. The Aorus RGB Memory kit is expected to begin shipping by the end of June for $229. While that’s still not cheap, the inclusion of the dummy modules makes it the most economical option for filling out all your memory slots with LEDs. Other RGB-equipped memory options require you to buy working RAM to fill each slot; a 32GB kit of HyperX Predator RGB will set you back $491 on Amazon, and Corsair’s 32GB Vengeance RGB kit costs $468.